"the Mirror and the Sketch quickly fell by the wayside, Junior Express had more success..."
There was an assumption in the 1950s that as children grew out of comics (by the age of 11 or 12) they would graduate to story papers and eventually newspapers. To this end, a number of daily publications launched their own junior versions, combining news items aimed at young teenagers (but not necessarily current affairs) and comic strip stories. The intention being, of course, that the newspapers would build a loyalty among the young readers who would then stick with them as they progressed to adulthood. A children's newspaper was nothing new. Subtitled "The Story of the World Today for the Men and Women of Tomorrow," The Children's Newspaper was one of the twentieth century's most successful magazines for children, starting in the aftermath of the First World War and running for 46 years. The inspiration for The Children's Newspaper was an offshoot of The Children's Encyclopaedia. The debut issue, dated 22 March 1919, was priced at 1½d (a little less than 1p in today's money) and was deliberately designed to look like an adult newspaper, enlivened by the addition of a photograph on the cover. Issues covered included a report on the British coal industry to how the railway system had been damaged by the war. Founded by Arthur Mee, the paper epitomised Mee's values and reflected the editor's twin faiths of Christian ethics and the British Empire. Mee believed that children could be guided to better, more creative lives through education. At its peak The Children's Newspaper sold 500,000 copies a week. But by the 1950s, after Mee had passed away, sales began to drop and although the paper was still very popular amongst 8 to 10-year-olds interest waned rapidly with older readers. It was at this point that Junior Mirror, Junior Express and Junior Sketch appeared-each published by Britain's popular national newspapers. While the Mirror and the Sketch quickly fell by the wayside, Junior Express had more success by virtue of the fact that it kept reinventing itself in different formats. 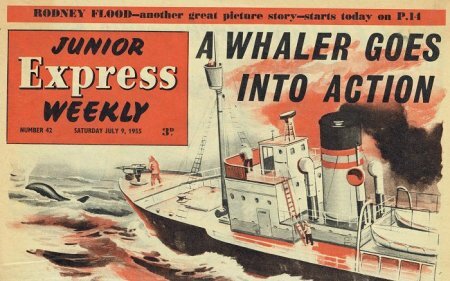 The first issue of Junior Express was cover dated 4th September 1954, and cost 2d (around 1p in today's money). Launching in its first issue was a British science fiction comic strip created by former R.A.F. aircraft enginer Sydney Jordan, called Jeffe Hawke - Space Rider, whose adventures were also continued in the Daily Express newspaper (from February 1955)- with the obvious intention of attracting loyalty readership from younger readers. 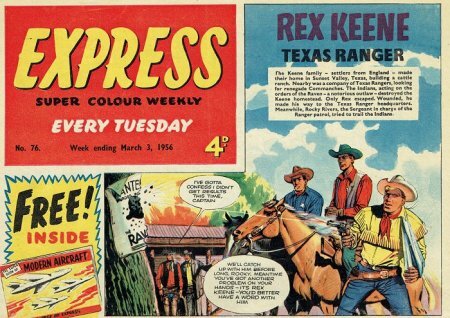 Over time, the news content of Junior Express was reduced as it proved less popular and was then dropped almost entirely when the Mirror and Sketch versions ceased publication - in favour of the comic strips, and as of issue 39 the title changed to Junior Express Weekly, and then simply Express Super Colour Weekly, which was clearly designed as a rival to the hugely popular Eagle comic. In April 1956, the News of the World, launched Rocket (allegedly edited by Douglas Bader), however, by 1956 Rocket merged with Express which was now called Express Super Colour Weekly and Rocket. 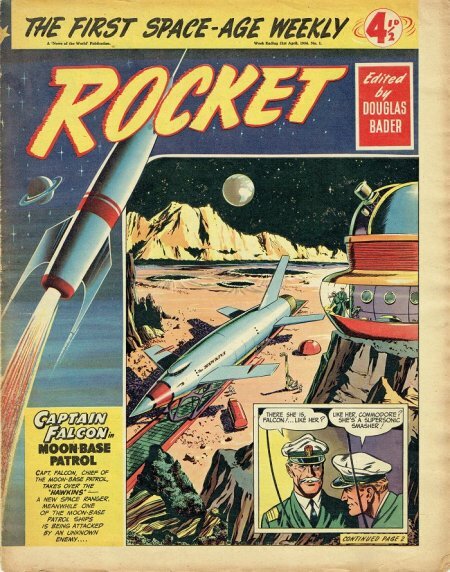 Before the end of the year Rocket had disappeared from the title on the front page but was still credited in the printer notes at the bottom of the back page (right up until the final issue). Express now became known as Express Weekly. 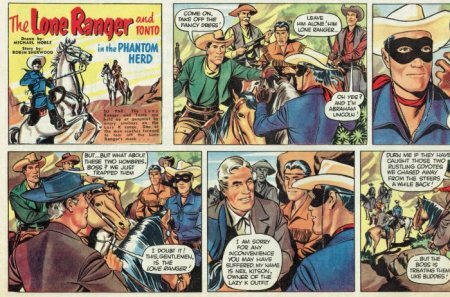 Notable strips including Ron Embleton's Wulf the Briton (later reprinted in Marvel UK's Forces in Combat), Rex Keene Texas Ranger and Jet Morgan, a character from the BBC radio series Journey into Space. 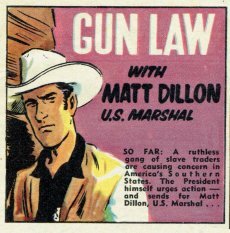 Gun Law with Matt Dillon U.S. Marshall later replaced Rex Keene and issue 205 saw the introduction of another popular TV Western, The Lone Ranger and Tonto illustrated by Woodford born artist Mike Noble, who, like Ron Embleton would go on to become one of Britain's most celebrated comic strip artists later illustrating for TV Comic, TV Century 21 and Look-In. 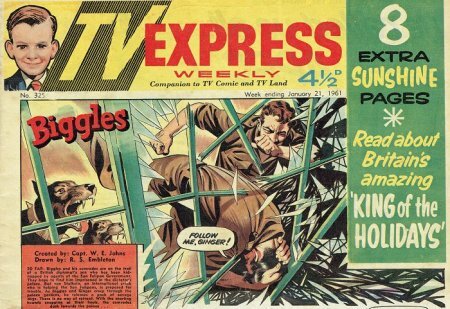 The comic changed its name again to TV Express Weekly with issue 286, with a new strip of the popular ITV series No Hiding Place added to the existing Gun Law and Lone Ranger. But in spite of adding 'TV' to its title these were the only television shows featured in comic strip form. With issue 298 (16th July 1960), the publication began the first of a number of biographical comic strips; Green for Go! The Amazing Life Story of Hughie Green, told the story of the popular Canadian born TV gameshow host and particularly his escapades as a pilot during World War Two. A few weeks later Biggles appeared as the featured (front page) comic strip and three American animated series; Huckleberry Hound, Yogi Bear and Mr Jinks with Pixie and Dixie also appeared, ideally to appeal to younger readers. 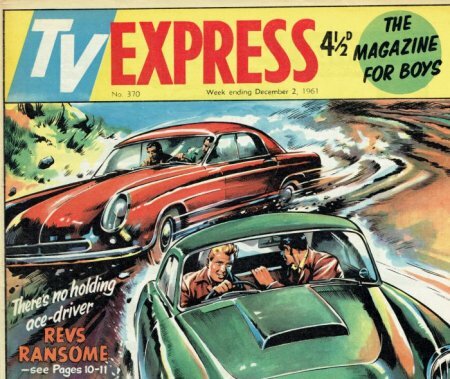 In January 1961 there was another subtle change to the comic's title, TV Express Weekly with the sub-heading Companion to TV Comic and TV Land (around this time Gun Law moved to TV Comic), but by the summer of 1961 this sub-heading was dropped and the publication became simply TV Express (THE Weekly Magazine for Boys) and was reduced in size to become less broadsheet and more tabloid, in order to cut printing costs. By this time Biggles had been relegated to a single inside page and the cover feature was the wartime stories of Colonel Pinto. 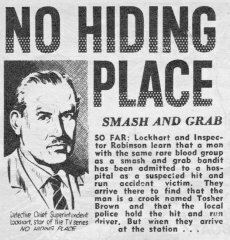 With issue 347 (24th June 1961) Danger Man joined the growing line-up of TV related articles, although this was purely a text story and not a comic strip. Another comic strip, Life's A Laugh With Alfie and Bill, appeared - based on the fictional escapades of actors Alfie Bass and Bill Fraser - from the popular ITV series Bootsie and Snudge. However, neither the TV title nor the character names were used for the comic strip, presumably because TV Publications Ltd had not wanted to pay Granada Television certain publishing rights and reached separate agreement with the actors for the use their likenesses. With Issue 370 (2nd December 1961) Colonel Pinto was relegated to the inside pages to be replaced by a feature 'splash' cover, the first of which was Revs Ransome, who had been appearing in a black and white series of strips in the inner pages since the summer. But by now the publication's days were numbered. 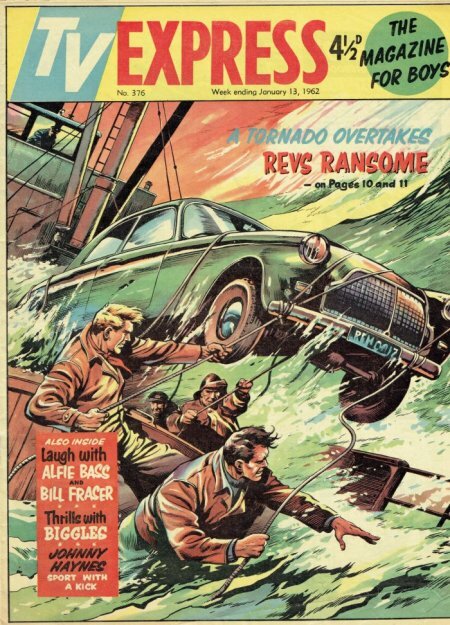 Issue 376 dated 13th January 1962, saw the finale for TV Express - comic strips stories featuring Col. Pinto, Revs Ransome, Biggles, No Hiding Place and Wulf The Briton were all bought to conclusion, and Danger Man's adventures were also bought to an end. 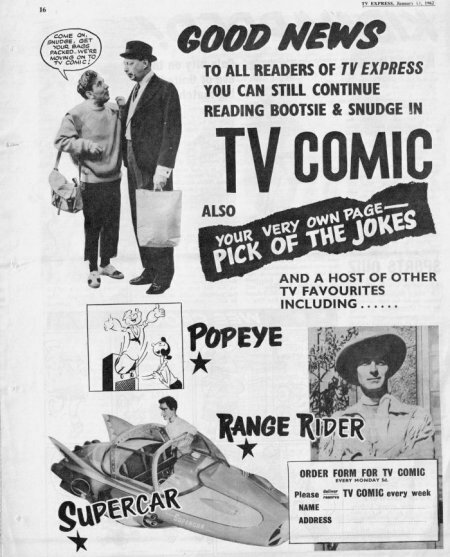 Readers were informed that they could continue reading Bootsie and Snudge (the full character names from The Army Game appearing for the first time) in TV Comic from the following week, and they would be joined by 'a host of other TV favourites including..." Popeye, Range Rider and Supercar. And with that one of Britain's superior TV related comic publications of the 1950s and early 60s came to an end.